Just199 Hosting is a leading provider of affordable cloud hosting services for both individuals and small businesses. Founded on the idea of exceptional customer service and support, our objective is to provide a top notch hosting experience cheaper than that provided by our competitors. With over eight years of experience in the web hosting industry, we bring a level of customer service and technical expertise that you can count on. 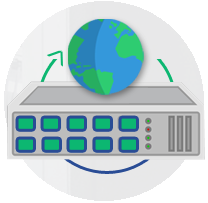 We understand the importance of uptime and reliability and thus we are committed to providing one of the most stable and well performing hosting solutions available on the market today. Just199 Hosting believes in premier quality and delivering promises. Although we do take pride in offering competitive pricing, we do not compromise on the caliber of infrastructure or the features that we offer. In addition to running some of the most advanced hardware available on our premium network, we offer some of the most advanced software to our clients at no additional cost. Ready to get started? Our simple and easy to use hosting service makes getting your website online a very painless process! Unlike some other providers that outsource their support to India, our team is entirely in-house and is committed to serving our clients. We treat each customer with the utmost respect. You're not just a number to us, you're part of the Just199 Hosting family! We utilize the most advanced control panel technology on all of our hosting services to ensure that our clients have all the power they need to easily manage any aspect of their service. We only run top of the line hardware here. Are you a nerd like us? You'll be happy to know that we're running at least 32 GB of RAM, Quad Core Xeon CPUs, SSD drives, and RAID on all of our servers. We're privately owned and have been growing steadily since we first started in 2006 thanks to all of the great referrals that existing clients send our way!